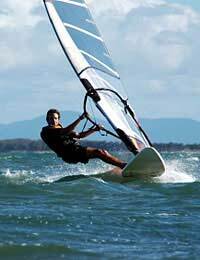 Wind surfing, or board sailing, is a relatively cheap and safe way for people of all ages to get active out on the water. Wind surfing is a watersport that uses a board with a single sail and mixes elements from both sailing and surfing, and throws in an additional level of freestyle athleticism. The windsurf board, or sailboard, is typically two to five metres long and attached to a sailing rig by a flexible joint called the Universal Joint or U-Joint. Unlike a rudder-steered sailboard, a wind surfer steers their craft by tilting and rotating the mast and sail as well as by tilting and carving the board. Wind surfing is comparatively safe on inland waters such as lakes or rivers because capsizing is not a problem and collision damage is unlikely because the boards are light and loss of control soon results in a quick stop. Wind surfing on the sea however presents much greater risks. The stability of the surfer is greatly undermined by the waves, the strength of the wind and the rapid downwind drift. Before heading out for a day at the beach windsurfing it is wise to first of all check the shipping or local weather forecast for any signs of ominous weather. Many rescue incidences are the result of something on a wind surfer’s set-up that was overlooked or not fitted properly. Surfers should make three basic checks of their equipment before every sail. Make sure the deck plate is secure and the rig attached properly. Also check for signs of wear on the ropes. Ensure the outhaul and downhaul are tightened and sufficiently cleated off, with the rope ends tidied or stowed away. Check that the fin is securely fastened into place. If everything looks shipshape then somebody should be informed of your whereabouts and when you are to be expected home. Once on the beach it is important to take note of any local regulations such as no boating zones, or areas designated for bathers. Less experienced surfers should take note of winds, with strong offshore winds being particularly dangerous because sailing back upwind to shore once tired or overpowered can prove very difficult. Windsurfers should all be equipped with a personal floatation device (PFD) and wear a wetsuit, unless it is very warm. To protect from the dangers of the sun they should apply sunscreen and wear a hat and long sleeves. Although wind surfing is by nature a solo activity, it should not be undertaken alone. Windsurfers should always sail in groups; not only is it more fun but much safer in case somebody gets into trouble. Finally, if there are any doubts about the conditions presenting too much of a challenge then it is best to stay on shore - a good windsurfer is always aware of their own limitations. When heading out into the water and back to shore it is good practise to sail slowly to avoid running aground and colliding with others. As it is a valuable buoyancy aid, it is important to stay with the surfboard no matter what happens, but at the same to stay away from everything else, including other surfers, bathers or boats or hazards such as rocks or buoys. As a general rule it is wise to only sail out as far as is necessary and as far as would be able to swim back to shore. Despite all the necessary safety measures associated with the sport, windsurfers, by their nature, are notorious for their free and easy approach to their sport. This casual attitude has led to mercifully few fatalities because of the UK’s superior rescue services. However, if there are two safety factors that should be adhered to beyond all others then they are firstly to avoiding strong offshore winds and secondly to always sail with other people.